Ahhhh, the wonderful BMI scale. This method of measurement has shown us how serious the obesity epidemic has becoming in the United States and other western-influenced countries. The simplicity of measuring one’s BMI has allowed medical professionals to easily categorize people into set ranges. For the general public, the BMI is mostly good, there are only a few exceptions where a BMI can paint a false reality to the actual health of a person. BMI stands for Body Mass Index. It can be defined as a way of relating weight to height. You simply take your weight in kilograms and divide it by your height in meters squared. Like stated earlier, this is a convenient tool for medical professionals because it provides a simple and quick way to categorize someone as being healthy or overweight. The simplicity of the BMI makes it super simple to look at the world population as a whole and determine where everyone roughly stands in terms of being underweight, healthy, overweight, and obese. This is easily the most common problem with using the BMI. Since it only looks at height and weight, BF% and LBM (Lean Body Mass) aren't factored in. Most people would agree that 12% body fat was a healthy body fat to have as a young adult, and it's pretty clear that I am not overweight, at least not by much of the Western World's standards. According to the BMI Chart above, at 5’11” and 180) pounds I have a BMI of 25. By BMI standards, I would be considered overweight! People in the fitness industry often raise their middle finger at people who use the BMI, but like I said earlier, the MAJORITY of the world's population isn't carrying around extra LBM. BMI fails to address individuals with high LBM (muscle mass), but its also skewed in the other direction, for people with very little muscle mass. A study in 2008 by Romero-Corral et al. looked at data from the United States Third National Health and Nutrition Examination Survey. They discovered that when using the BMI, 21 percent of men and 31 percent of women met the requirements for being obese. However, when looking at those same participants body fat %, they found that 50 percent of men and 62 percent of women were considered obese. (Edelson, 2015). So not only can the BMI overestimate whether someone is overweight or not, it can also underestimate! 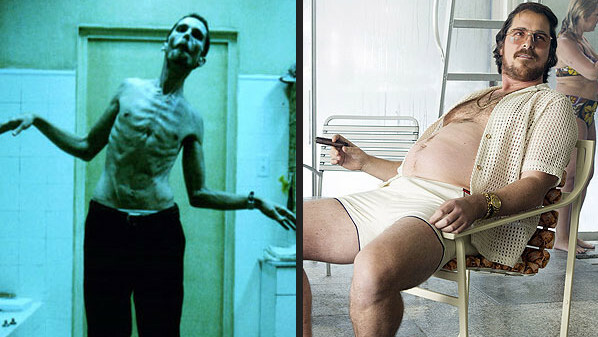 On a side note: If the BMI had an enemy, it would TOTALLY be Christian Bale... look how he has swung from one extreme to the other! "If the BMI is so bad, then how should I track my progress?" Well, there are a couple of ways that I have found to be much more accurate for tracking your body progress, especially if you are building muscle. Tracking your body fat percentage is much more reliable when determining your body composition. This is because it looks at your lean body mass (LBM). So someone could be 6 feet tall and weigh 185 pounds but be totally healthy if their body fat percentage is within a healthy range. The same applies for someone who is 6 feet tall and weights 165 pounds. They would be healthy according to BMI (looking at their height and weight), but their body fat percentage may show they are overweight because they have little muscle mass. This route is the easiest and most affordable. It might even be more accurate. I have found that tracking my waist measurements in comparison to my height to be one of the best ways to track progress. Fun Fact: There is actually science behind attraction and ratios in the body. This is known as the Adonis Belt. If you want some examples of what this would look like, click Here, Here, or Here. As you can see, The BMI is helpful for addressing a large population, but may not be so on a person to person basis. If you are currently losing weight and working out at the gym, don’t focus on getting to a healthy BMI range. Instead, you should shoot for a healthy body fat percentage, or more simply, a healthy height to waist ratio. I actually got the idea of tracking my height/weight ratio by following the Kinobody "Greek God" program. In terms of building a great physique, I have yet to find a more simple and effective approach to building lean muscle. I remember seeing this photo when I was younger and thinking he was freaking ripped! He is definitely in shape, but his physique is absolutely attainable for anyone to achieve. Here's the program if you're interested.